Pakistan Wants To Reform Madrassas. Experts Advise Fixing Public Education First The government hopes to reform seminaries, which are often seen as places where students are indoctrinated with extreme interpretations of Islam. Experts argue the entire education system must change. 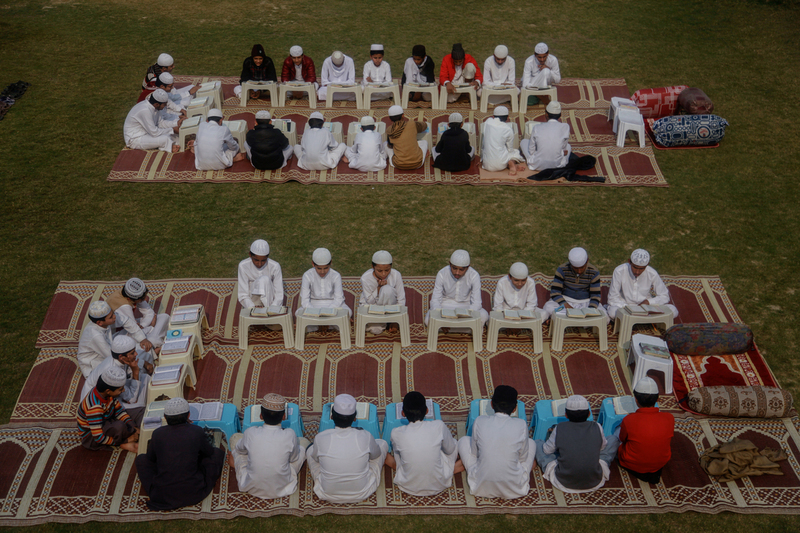 Students sit in class at Jamia Muhammadia, a madrassa in the Pakistani capital Islamabad. Youths sporting peach fuzz sway as they chant parts of the Quran. They sit in the courtyard of a sprawling Islamic seminary, or madrassa, on the outskirts of the village of Meer Muhammad, in Pakistan's rural heartland in Punjab. They need little else, argues Muhammad Saleem Asif, a religious scholar and the principal of the madrassa, the Roza Tul Quran Al Kareem school. These students, repeating the words of God, raise the spirits and morals of their community, he says. 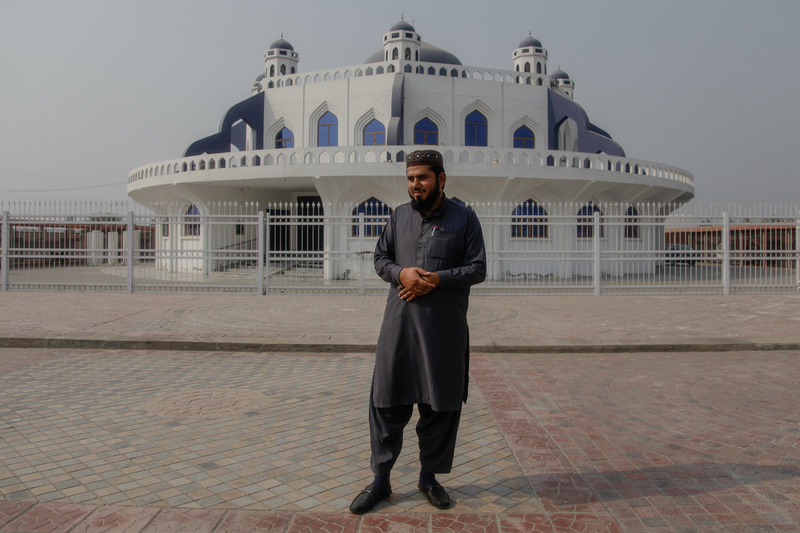 Muhammad Saleem Asif stands in front of the mosque attached to the madrassa he runs in the village of Meer Muhammad. Seminaries "bless the communities around them," he says. But in the village, just around the corner from the madrassa, the principal of a government-funded girls' high school worries about the seminary's influence, and its lack of basic education. "This is a matter of concern for our entire society," says Abida Akram. "I try [to] keep my students and my kids away from the madrassas. They contaminate the students' minds, and if they remain unchecked, it will lead to disaster." People walk in Meer Muhammad, a village in Pakistan's Punjab province. Akram gestures toward a muddy lane, where the madrassa keeps another compound for its female students. It is dank and dirty, in contrast with the well-lit compound reserved for older boys, which features new computer equipment. Many of the madrassa's female students and teachers wear long robes and face veils, a style of dress imported from Saudi Arabia, which follows a harsh interpretation of Islam. Akram says her school takes in the madrassa's female dropouts, whom she describes as poorly educated. 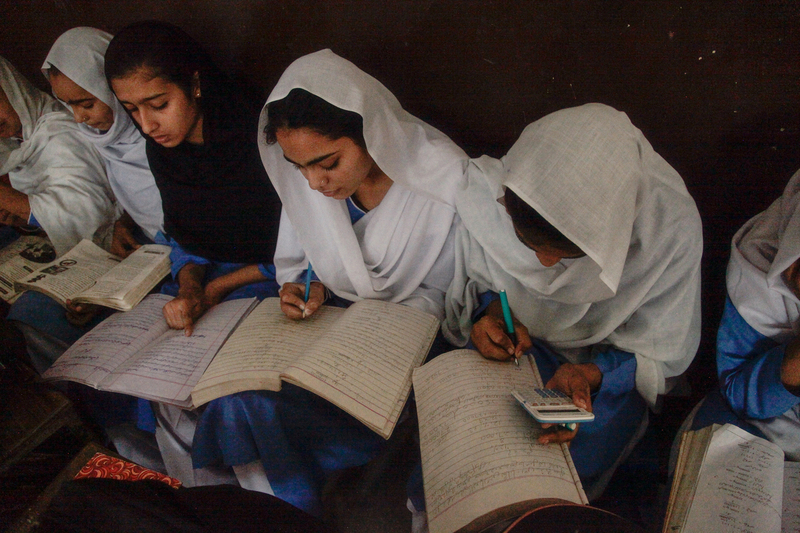 Young women study in a math class in a public high school for girls in Meer Muhammad. 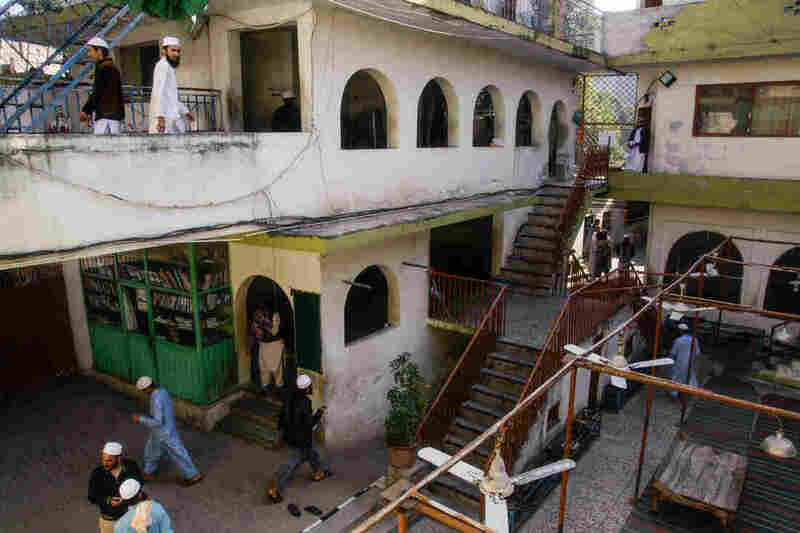 These scenes and tensions play out across Pakistan, where madrassas flourish. From an estimated 150 at Pakistan's independence in 1947, there are now some 32,000 madrassas attended by some 2.5 million students, according to Azmat Abbas, author of Madrassah Mirage: A Contemporary History of Islamic Schools in Pakistan. (Other estimates range as high as more than 60,000 madrassas). Pakistan's Prime Minister Imran Khan has said he wants the madrassas to produce better-qualified students. "Seminary students should also become engineers and doctors," Khan said last August, in his first public address. He called on madrassas to introduce a core curriculum including subjects like math, English and science. Jamia Muhammadia is a madrassa in the Pakistani capital Islamabad. Khan's call — not the first from a Pakistani leader — reflected decades of anxiety surrounding Pakistan's madrassas. Most are privately funded and fall outside government control, and there has long been concern that they produce unskilled graduates steeped in intolerant versions of Islam. Madrassas boomed under the decade-long rule of Gen. Muhammad Zia ul-Haq, which ended in 1988. Many catered to Afghans who had sought refuge in Pakistan, fleeing the Soviet war in their own country. The Taliban movement later emerged among Afghan students who were trained in some of those seminaries. And some of the most prominent leaders of Pakistani sectarian and militant groups have come from madrassa backgrounds. But research over the years into madrassas' links with militancy has so far presented a complex and incomplete picture. Some research has found that although madrassa students show high levels of support for violence, there is also notable support for violence among public school students — and they far outnumber madrassa students, who account for less than 10 percent of all children who attend school in Pakistan. According to researchers who have studied madrassas, now the majority of seminaries do not advocate militancy. Instead, they follow a deeply conservative interpretation of Islam similar to that preached in Saudi Arabia. Other madrassas are aligned with Barelvis, adhering to a South Asian stream of Sunni Islam which encourages visits to saints' shrines and embraces chanting and dance. A smaller number of madrassas are operated for Shiite Muslims. Barelvi madrassa students attracted attention last fall, when they formed the bulk of angry, sometimes violent, demonstrations across Pakistan. They were lashing out against the Supreme Court's decision to acquit a Christian woman accused of insulting Islam. 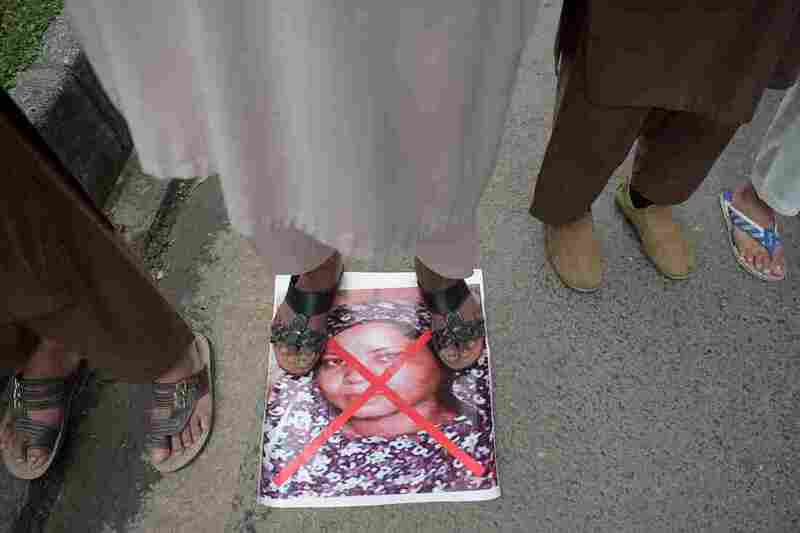 They did not recognize the legitimacy of the court, and led calls for the woman, Asia Bibi, to be hanged and decapitated. In urging madrassa reforms, Khan is trying where decades' worth of other Pakistani government attempts have failed. 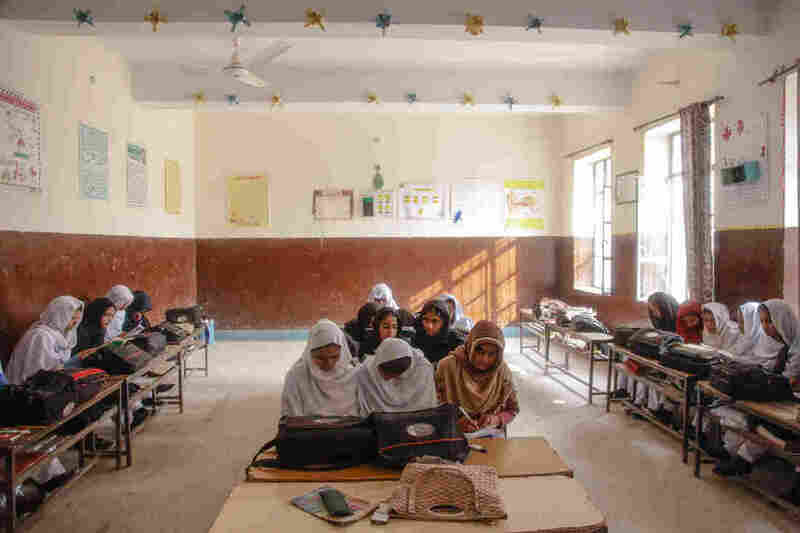 The most recent attempt to reform madrassas was made by the former government of Punjab, Pakistan's most populous province, before it was voted out of office last year. A protester steps on an image of Asia Bibi, a Christian woman accused of blasphemy, during a demonstration after the Pakistani Supreme Court's decision to acquit her in Islamabad last year. Malik Muhammad Ahmad Khan, a legislator who served as spokesman for the former provincial government, says the province shuttered some two dozen madrassas, seen as irredeemably militant. He says many other madrassas were teaching students that Muslims who followed different sects were infidels — worthy of being killed. The provincial government destroyed the incendiary material, though it did not close down these madrassas. And it was not able to introduce basic school subjects or moderate the madrassa syllabus. There was a lack of political will to push against powerful madrassas whose backers continue to form a minority voting bloc in Pakistan's parliament. 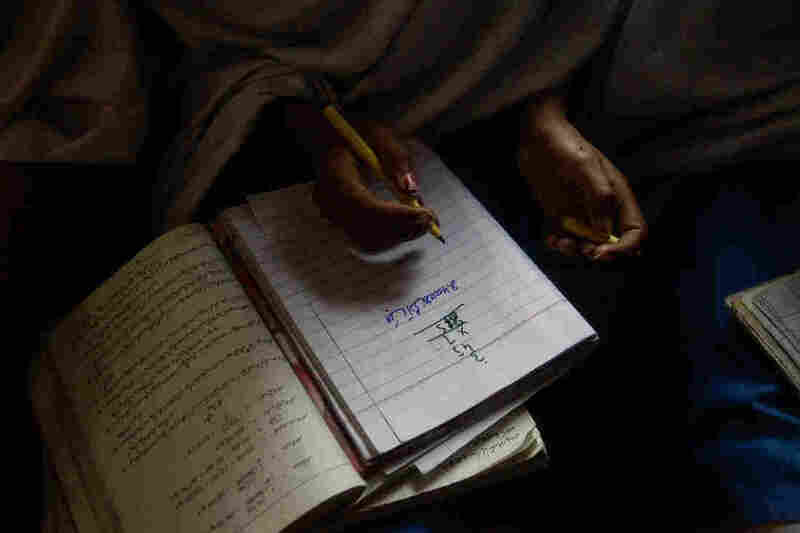 A student takes notes in a math class in the Government Girls High School of Meer Muhammad. After the prime minister's speech in August, National Assembly speaker Asad Qaiser vowed the government would leave madrassas alone. "We are neither introducing a new syllabus for madrassas nor are we drafting any policy," Qaiser told a group of clerics in October. But the government plans to introduce a uniform curriculum for public schools, private schools and madrassas. "You might be surprised to know there is no resistance," Mahmood says, referring to madrassas. "On the contrary, they want to carry out these reforms." Not really, madrassa leaders say. 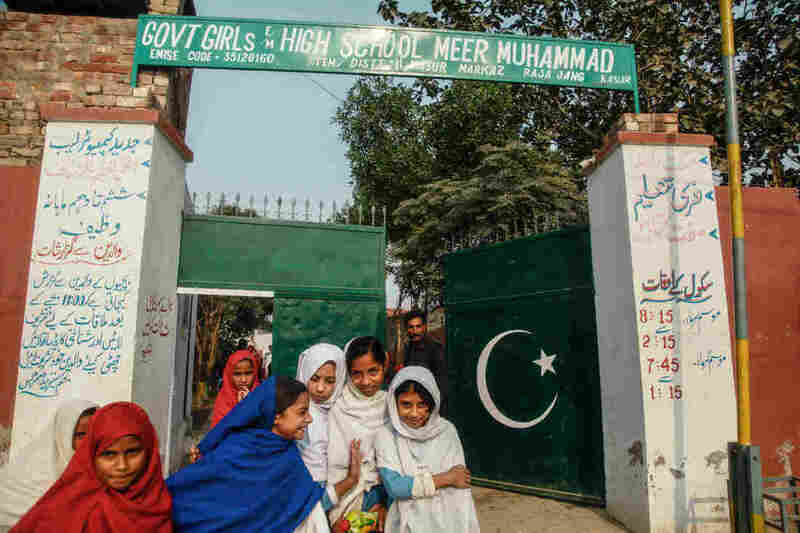 "The seminaries oppose reforms — they think the government is trying to roll back or ruin this system," says Shaikh Tanveer Alavi, a senior teacher at Jamia Muhammadia, a madrassa in Islamabad. He says they worried the government was trying to undo madrassas' curriculum and erode their independence. Alavi says many madrassas, including his, were already adding core curriculum subjects, to offer more employment opportunities to graduates. He showed NPR reporters a math class, where a teacher scribbled algebra equations on a white board. Students tried to solve the problems in groups on a carpeted floor. A teacher gives an algebra lesson during a math class at the Jamia Muhammadia madrassa. Madrassah Mirage author Azmat Abbas says seminaries will resist reform. Right now, "they can do whatever they want," Abbas says. "With state regulation comes responsibility, and then penalties." And experts on Pakistan say the government's focus on madrassa reform misses the point. 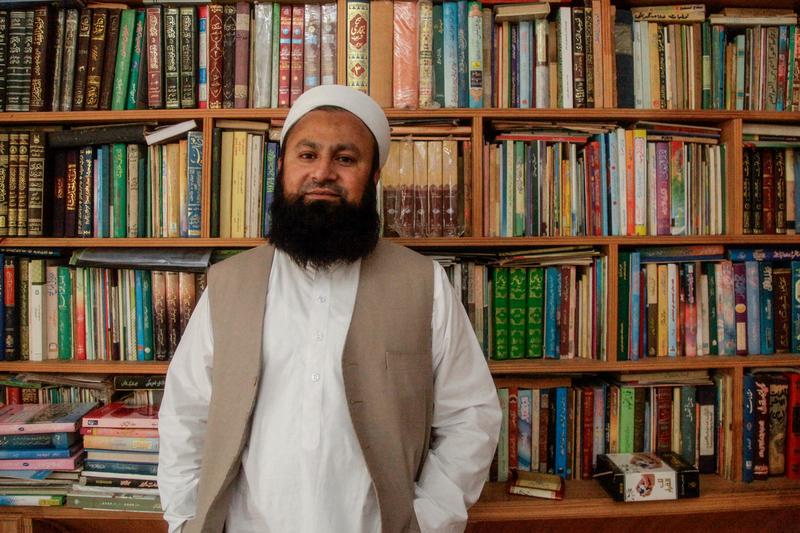 Sheikh Tanveer Alavi, a senior teacher at Islamabad's Jamia Muhammadia madrassa, stands in his library. "The seminaries oppose reforms — they think the government is trying to roll back or ruin this system," he says. With a better school system, he says, parents will have less incentive to send their children to madrassas. More than 22 million Pakistani children are not in school, largely because they have no decent institutions to attend. That overshadows the estimated 2.5 million children enrolled in madrassas, he says. Young women study in a math class in the Government Girls High School of Meer Muhammad, where the principal says there is a shortage of teachers. 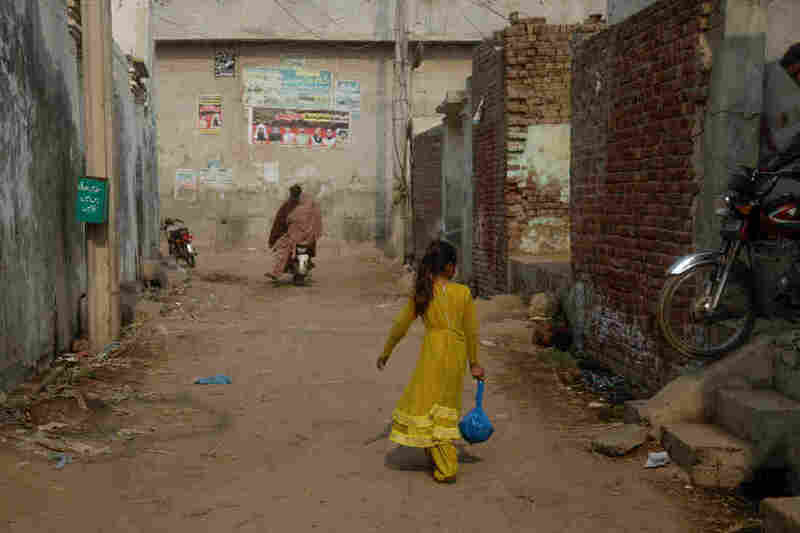 Back in Meer Muhammad, Akram, the girls' school principal, is weary of reform promises. Perhaps, she says, if the government forced the madrassas to appoint "a professional instead of a mullah [cleric]" to teach and oversee education, "I think it will be much better." Students exit the Government Girls High School of Meer Muhammad.